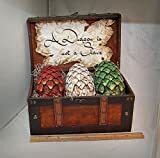 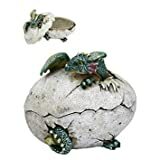 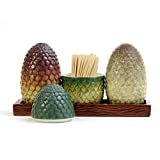 If you're a fan of the HBO show Game of Thrones, or want to pose as one (you know, to attract suitors), check out this Game of Thrones Dragon Eggs Collectible Set. 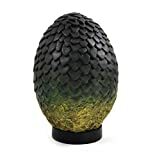 The set is a miniaturized version of what Danaerys Targaryen received as a gift for her marriage to a massively huge and eventually endearing man, Khal Drogo. 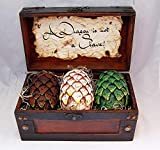 Made from resin (not dragon essence) the eggs are perfectly encased in a silk-lined wooden box bearing the Targaryen sigil, a three-headed dragon.